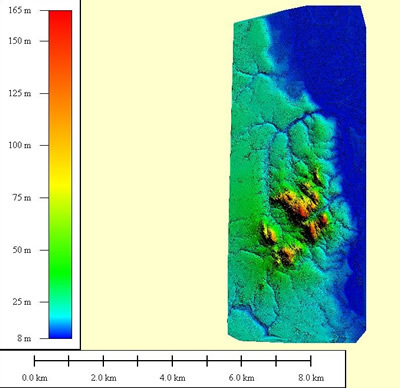 Today, LiDAR is considered as a matured technology for direct measurement of earth’s surface and with further processing, in addition to Digital Terrain Model (DTM), a wide number of applications and products can be produced. It is extensively used worldwide especially in developed countries. But up to now its benefits are not realized in several developing countries like the Philippines. The lack of knowledge, training, and qualified personnel could be attributed as one of its cause. Some LiDAR service providers’ delivers a mixture of first and last pulse point clouds in XYZ format only without additional information. As a standard practice quality check should be made before further processing. The objectives of this research are to study the handling and processing of such data. 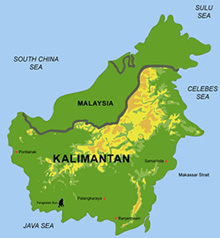 Filtering to derive bare earth, classification, and reconstruction of 3D building model were carried out with the LiDAR datasets from Kalimantan, Indonesia to fulfill the objectives. The characteristics of the said data were investigated first. This is followed by filtering and classification into different classes. Furthermore, datasets were used to construct 3D building models. All this tasks were implemented with Terrasolid software. Another part of the thesis is the generation of orthophotos from the digital aerial images taken simultaneously with laser scanner. Exterior orientation parameters derived from the global positioning system (GPS) and inertial navigation system (INS) were used but does not give good results. Thus aerial triangulation was carried out first utilizing LiDAR data as ground control points (GCPs) because no GCPs are available. The Digital photogram metric workstation (DPW) from the Inpho company was used in this process. The processing and the results are all presented in this thesis. 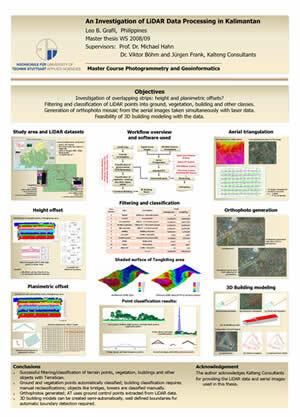 The results of filtering and classification were visually analyzed by taking the generated orthophotos into account. A DTM was successfully generated over urban and forested areas.